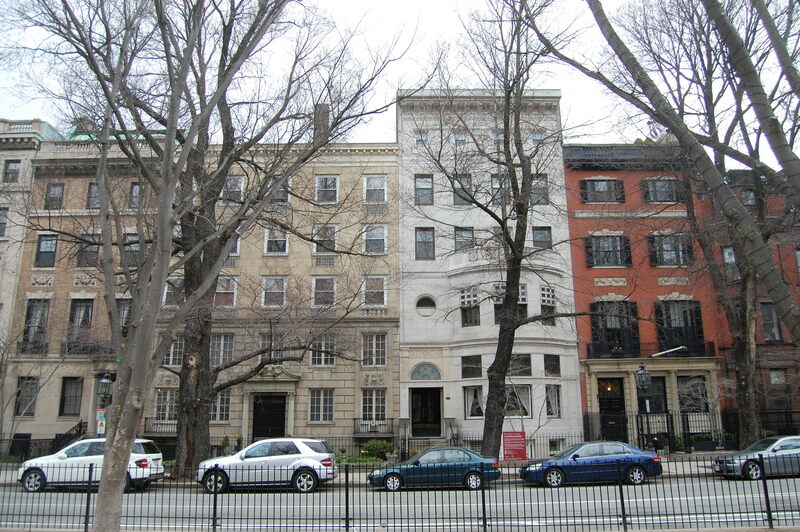 393 Commonwealth is located on the north side of Commonwealth, between Massachusetts Avenue and Charlesgate East, with 391 Commonwealth to the east and 395 Commonwealth to the west. 393 Commonwealth was designed by Little and Browne, architects, and built in 1899-1900 for Josephine (Moore) Dexter, the widow of Chicago attorney Wirt Dexter. 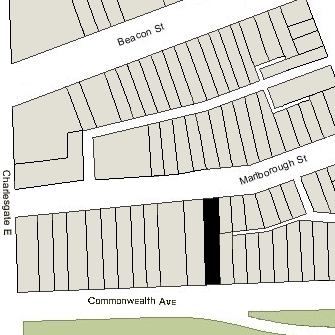 The rear of the lot on which 393 Commonwealth was built extends north to Marlborough Street and has a secondary street address of 442 Marlborough. Josephine Dexter purchased the land for 393 Commonwealth on May 12, 1899, from the estate of Abbott Lawrence. He had purchased the land on January 18, 1886, from a real estate investment trust formed by Francis A. Palfrey, Francis A. Osborn, and Grenville T. W. Braman, part of a tract of land the trust had purchased on June 1, 1880, from the Boston Water Power Company. When they sold the lot to Abbott Lawrence, the trustees included language prohibiting the use of any building on the land as a stable and prohibiting the erection of any building of more than one story in height within thirty feet of Marlborough. Click here for an index to the deeds for 393 Commonwealth, and click here for further information on the land west of Massachusetts Avenue between the south side of Beacon and the north side of Commonwealth. Katharine Dexter graduated from MIT in 1904 and in September of that year married to Stanley R. McCormick, son of Cyrus McCormick, inventor of the reaper and founder of the International Harvester Company. Two years after their marriage, Stanley McCormick was hospitalized with mental illness and spent the rest of his life under care in Santa Barbara, California. He died in January of 1947. 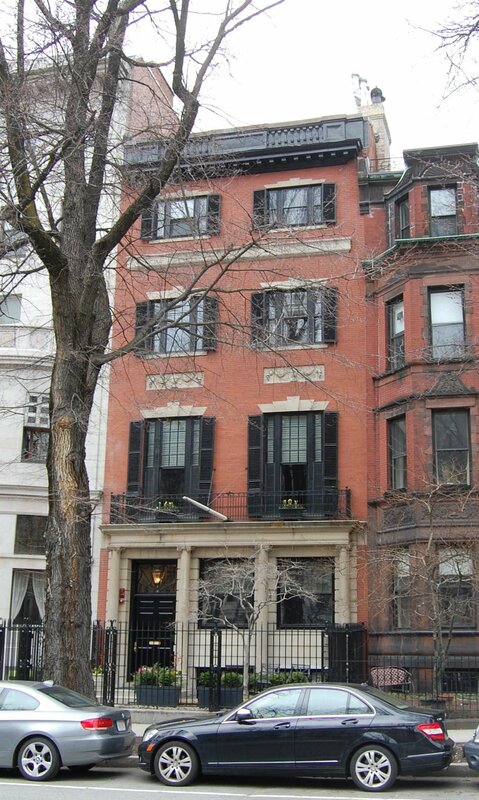 By the 1909-1910 winter season, Katharine McCormick had resumed living with her mother at 393 Commonwealth. She also maintained homes in New York and Santa Barbara. She was an active advocate of woman’s suffrage (as was her mother) and strong supporter of women’s education, the League of Women Voters, and family planning. On June 5, 1924, Josephine Dexter transferred 393 Commonwealth to Katharine McCormick. In August of 1926, Katharine McCormick purchased 407 Commonwealth and made it her home. In 1929, Josephine Dexter purchased Prangins, an estate outside of Geneva, Switzerland, primarily for Katharine McCormick’s use. Josephine Dexter continued to live at 393 Commonwealth until her death in November of 1937. Katharine McCormick continued to live at 407 Commonwealth and to maintain Prangins in Switzerland and a home in Santa Barbara. She also continued to own 393 Commonwealth, apparently leaving it vacant until the early 1950s. 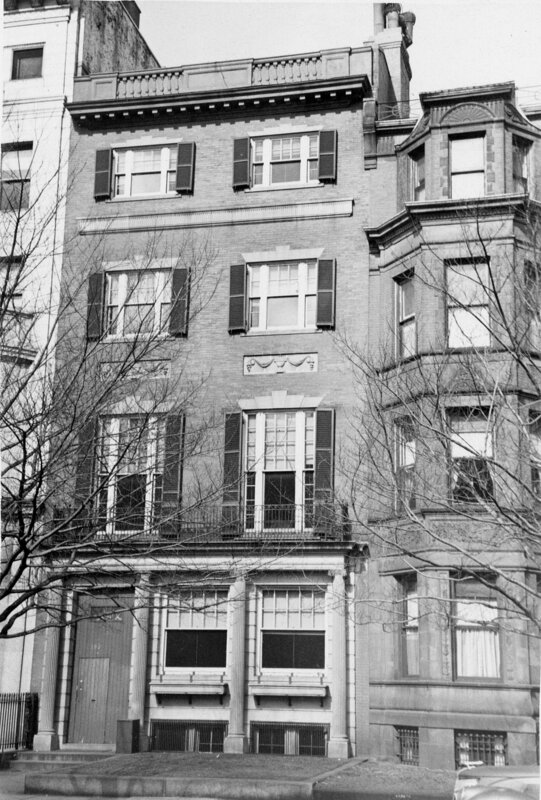 In March of 1952, Katharine McCormick sold 407 Commonwealth and made 393 Commonwealth her Boston home. In 1962, at the suggestion of her friend Adlai Stevenson, she donated Prangins to the US government, for use by the US diplomatic mission in Geneva. Katharine McCormick died in December of 1967, leaving much of her estate, including 393 Commonwealth, to MIT. On May 26, 1971, 393 Commonwealth was purchased from MIT by the Society of Jesus of New England. It used the house as a rectory. On October 26, 1981, 393 Commonwealth was purchased from the Society of Jesus of New England by Marvin Smith, trustee of the 393 Commonwealth Associates Realty Trust. In September of 1981, in anticipation of the sale, the Society filed for (and subsequently received) permission to establish the legal occupancy as professional offices. On April 2, 1982, 393 Commonwealth was purchased from Marvin Smith by Gaetano F. Morello, trustee of the 393 Commonwealth Avenue Trust. In December of 1982, he filed for (and subsequently received) permission to establish the legal occupancy as professional offices for an advertising agency. On December 15, 1983, 393 Commonwealth was purchased from Gaetano Morello by Thomas Allen Robinson and his wife, Lessie Elaine (Thiele) Schroeder Robinson, trustees of the Dexter House Trust. 393 Commonwealth became the offices of Robinson Associates, Inc., an advertising and public relations agency. In 1991, it merged with several other agencies to become Cuneo, Conrad, Robinson, Wilgus, Inc. The new firm continued to be located at 393 Commonwealth. In August of 1992, Thomas Robinson filed for (and subsequently received) permission to convert the existing penthouse into an apartment. On February 12, 2004, Thomas Robinson and Richard F. Hazelton (successor to Lessie Robinson as trustee of the Dexter House Trust) transferred 393 Commonwealth to Dexter House Development, Inc. (Thomas Robinson was the president and treasurer of the firm). 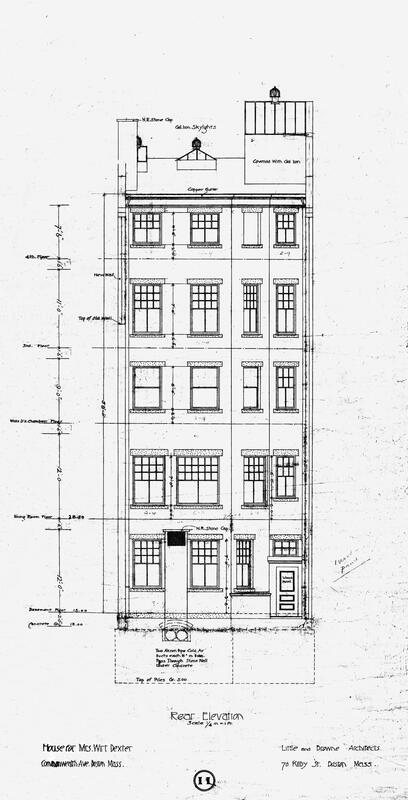 In June of 2005, Dexter House Development filed for (and subsequently received) permission to convert 393 Commonwealth into six apartments. On August 18, 2005, it converted the property into six condominium units, the Dexter House Condominium. 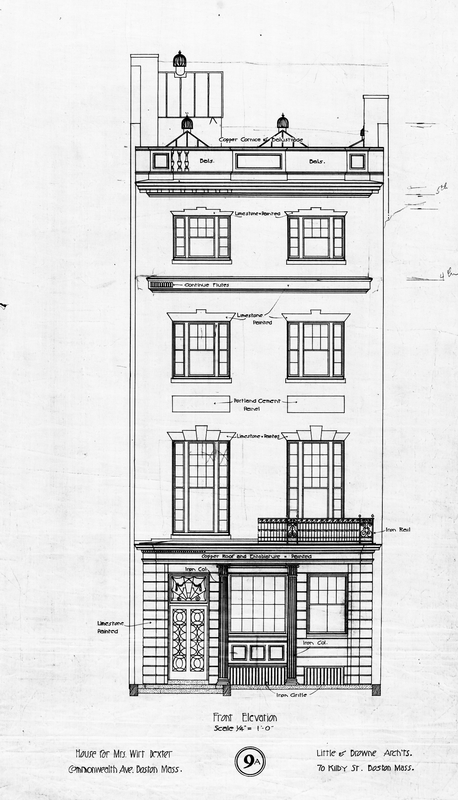 Below are front and rear elevations of 393 Commonwealth drawn ca. 1899 by Little and Browne for Mrs. Wirt Dexter. These are provided courtesy of Historic New England, whose collection also includes additional original architectural drawings of 393 Commonwealth.